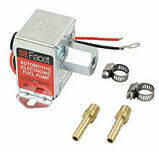 Facet Electric Fuel Pumps put out about 4 psi. (30 GPH). Can be used with gas or alcohol. It is recommended that a fuel regulator be used with all electric pumps.